* Houdini (Part I)--The story of the escape artist who became the highest-paid performer in vaudeville. From his early days as a newsboy, to his years struggling in beer halls, sideshows, dime museums, and other lowly venues, to his success as the Handcuff King, to his rise to international fame. * Larry Weeks--A master juggler, he dwelt amidst a chaotic collection of magic memorabilia--including the sole surviving copy of "The Grim Game," Houdini’s lost film. * Martin Sunshine--Every summer for 35 years, he donned a fez and performed at a resort as Kismet the Magician. * Lung Tung--Once the Court Magician to the Empress of China, he had been reduced to passing the hat in hotel lobbies. But he could still hear the sounds of the court and the reverberations of the gong. 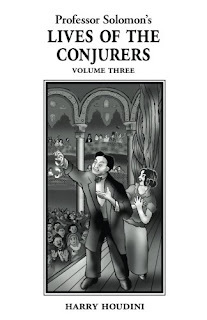 You can purchase Lives of the Conjurers, Volume Three at Amazon.com (U.S.) and Amazon.co.uk (UK). Free PDF downloads of the first two volumes are available at professorsolomon.com. UPDATE: With this now in hand, I can say it's well done. I was also interested to see that tells in detail the story of Rick Schmidlin's acquisition of The Grim Game from Larry Weeks. The book nicely credits my interview with Rick as the source.